(From left) Dato’ CM Vignaesvaran Jeyandran, Chief Executive of Human Resources Development Fund (HRDF) of Malaysia; Chua Soon Ghee, Partner and Head of Southeast Asia of A.T. Kearney; Tan Sri Dr. Munir Majid, Chairman of CIMB ASEAN Research Institute (CARI) and President of the ASEAN Business Club; Dato’ Hamidah Naziadin, Group Chief People Officer of CIMB Group and Shareen Shariza Dato’ Abdul Ghani, CEO of TalentCorp Malaysia pose for the cameras after the roundtable session on “Closing the Talent and Skills Gap in ASEAN”. 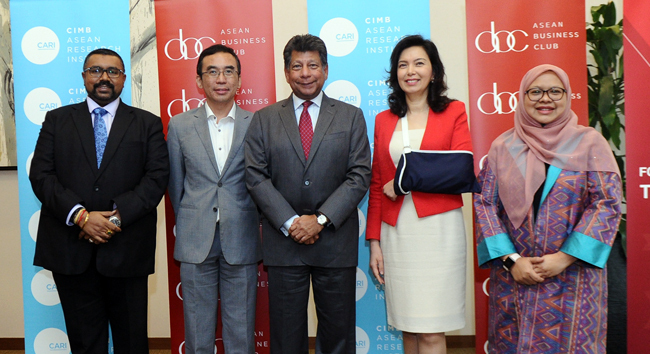 The roundtable was organised by CARI on 15 May, in collaboration with the ASEAN Business Club. Kuala Lumpur, 15 May 2018 – ASEAN need to intensify the intra-ASEAN skilled labour mobility in the near term, as well as implement urgent education reforms and workforce reskilling agenda in the long-term to remedy the extreme skills deficit, accentuated by the skills demand brought upon by the rapid digital revolution. Although the ASEAN Economic Community (AEC) has envisioned for the free movement of skilled labour and business visitors within the bloc, current arrangements are considered to be narrow in scope. The lack of true intra-ASEAN skill labour mobility within ASEAN would mean that skill gaps in ASEAN cannot be filled by talents from within the economic community. These are among the issues discussed during a roundtable titled, “Closing the Talent and Skills Gap in ASEAN” which was organised by CIMB ASEAN Research Institute (CARI) on 15 May, in collaboration with the ASEAN Business Club. The roundtable was chaired by Tan Sri Dr. Munir Majid, Chairman of CARI and President of the ASEAN Business Club. The panel of speakers comprised of Dato’ Hamidah Naziadin, Group Chief People Officer of CIMB Group; Shareen Shariza Dato’ Abdul Ghani, CEO of TalentCorp Malaysia; Chua Soon Ghee, Partner, Head of Southeast Asia of A.T. Kearney, Singapore; and Dato’ CM Vignaesvaran Jeyandran, Chief Executive of Human Resources Development Fund (HRDF) of Malaysia. Six mutual-recognition agreements (MRAs) were concluded by 2012 for engineering services, nursing, architectural services, tourism professionals, medical practitioners, and dental practitioners; while framework agreements for surveying and accountancy services have been signed. ASEAN also adopted and signed the ninth MRA for Flight Crew licensing in late 2017. Except for engineering and architectural services, progress for the rest has been slow. “MRAs for a number of professions have been signed and while the intention is noble, there has been no clarity or speed in implementation. Without the ability and real prospects to move intra-regionally, ASEAN professionals who are not able to move within ASEAN may move elsewhere. Current data suggests almost two million professionals from ASEAN member states live and work out of the ASEAN region. Therefore, ASEAN leaders, policymakers and industries need to work together collectively and collaboratively to close the gap between technologies, market demands and policy, to strongly commit to implementing the MRAs and to keep the pace and accelerating transformation. We also need to understand and harness our talent landscape, in order to meet current market gaps and predict future demand,” she said. The financial industry is also facing the realities of skills shortages, especially with the emergence of Fintech disruptors. According to a report by Asian Institute of Finance (AIF), 76% of employers in the domestic financial services industry faced talent shortages across all sectors. “CIMB has a workforce of about 37,000 strong in major ASEAN markets that we are present. The shortage of competent and skilled workers is of concern to our industry as financial services are one of the key contributors to ASEAN GDP growth. Intra-ASEAN mobility should be more efficient, and we need regulatory support for us to harness the best of ASEAN’s diverse talents. ASEAN should also establish an MRA for the financial experts to allow intra-ASEAN transfers of skills and knowledge. With new entrants coming into the financial industry through fintechs and other non-traditional competitors who are yet to be fully regulated, intra-ASEAN talent acquisition must speed up to meet the need of markets or we risk being irrelevant given the speed of disruption,” said Dato’ Hamidah Naziadin. A.T. Kearney’s study with the World Economic Forum on the Future of Production shows that ASEAN can benefit from Industry 4.0 and its impact on changing geographies and nature of production, but it will need to transform itself. While ASEAN has a strong legacy manufacturing base to leverage on, there is a growing human capital mismatch as quality of labour, rather than cost of labour, will be the new source of competitive advantage. “There is not just a shortage of skilled labour in ASEAN in the near-term to implement or integrate Industry 4.0 technologies, but the educational system and adult retraining programs will need an overhaul in many ASEAN countries to emphasise technology, digital and higher-order cognitive skills. In addition, ASEAN will also need to improve labour mobility, specifically around attracting skilled migrants that can help to increase and level up the Industry 4.0 labour base,” said Chua Soon Ghee. Malaysia has embarked on the reskilling and upskilling of the workforce for the Fourth Industrial Revolution through the Human Resources Development Fund (HRDF) established by the Human Resources Ministry of Malaysia. “Industry 4.0 is transforming entire industries and economies. HRDF has launched the National Workforce Human Capital Development Blueprint 2018-2025 early this year that outlines strategic initiatives to address workforce challenges associated with Industry 4.0, digitisation and automation. HRDF aims to support the national agenda of producing a 35% skilled local workforce by year 2020,” said its CEO, Dato’ CM Vignaesvaran Jeyandran. According to World Economic Forum, ASEAN is facing serious skills divide. 55% of Singapore workers are highly skilled, followed by Malaysia at 25%, Philippines at 24% and Thailand at 14%. Whereas highly skilled workers in Vietnam, Indonesia, Myanmar, Laos and Cambodia range between 4% to 10% only. “Skills deficit for present and future industry needs in ASEAN cannot be overstated. It has been estimated that there will be 68 million new entrants to ASEAN’s labour force by 2025 and ASEAN is at a crucial juncture to introduce education reforms at the national level to produce the workforce fit for industry 4.0 that has rapid and profound impact on all member states. More crucially, only with true intra-ASEAN talent mobility, especially for skilled professionals, will ASEAN be able to fully optimise its human capital potential,” said Tan Sri Dr. Munir Majid who chaired the discussion.